Get some bling in your life with rhinestone Silhouette cutting files! Min has just put in her PU store a fabulous range of Silhouette cutting files. 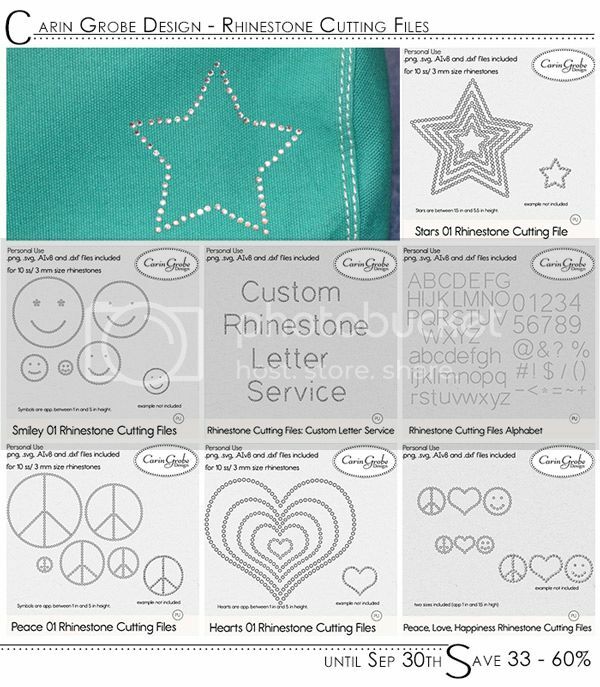 These are cutting files specifically to enable you to decorate an object or clothing with rhinestones. If you are wondering how a cutting machine will help to put iron-on rhinestones on something, Min has a great tutorial and all the information you will need in this very informative post on the Studio blog. She also has TWO freebies for you on the Studio blog! By cutting a placement template by machine all the tedious placement of the tiny stones is done in no time at all. She has lots of purchase options and one what I think is particularly appealing is the Custom Letter Service. If you would like to have cutting files for a single letter or a custom word, this is the right product for you. With the download you will find detailed instructions. Email Min with your requirements and she will create the cutting files for you and provide you with a store link to buy your own custom cutting files. What about a T-shirt with your child/grandchild’s name on it? That would make a great Christmas stocking filler. There are so many creative possibilities with these files, you will be limited only by your imagination!! Until the end of the month, you can save between 33% – 60%!